I spent a bit of time figuring out which shredder to buy. There are really cheap shredders that only cut your papers into strips and can't handle credit cards. And there are really expensive shredders that cut anything you throw at them into tiny pieces. Eventually I ended up picking a model in the middle of the pack. 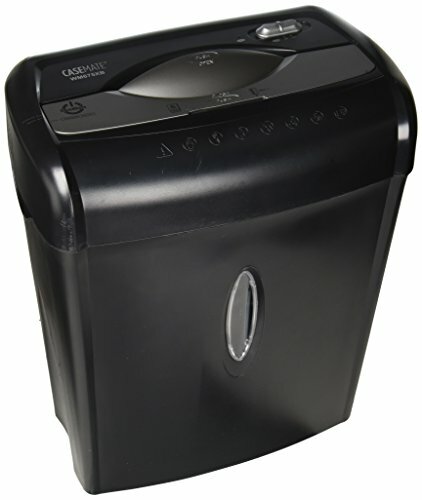 This review is for the Casemate WM675XBC Shredder, but it probably applies to the AmazonBasics 6-Sheet Cross-Cut Shredder as well. I suspect those two shredders are made by the same company and just rebranded as AmazonBasics/Casemate shredders. The "6 sheets maximum" icon as well as the row of warning icons next to the paper intake are identical on these two shredders. While the physical design is slightly different, I'd expect the mechanical parts, the motor and shredding teeth, to be quite similar. I suspect the only real difference between these two shredders is that the Casemate version has a lid that closes over the intake and costs a little bit more. If you're worried about safety, I'd pay the extra couple bucks for the Casemate version. For everyone else, the AmazonBasics version is probably fine. I had a set of minimum requirements for my shredder. I wanted it to be able to handle staples and credit cards, and i want at least some form of horizontal cutting capability. I knew at some point in the future someone would leave a staple in some pages they were shredding, and I didn't want that to mess up my shredder too bad. And I also knew that all of my credit cards had expiration dates that would eventually necessitate their destruction. Some people might have higher security concerns that make it more important for them to have their documents cut up into the smallest possible pieces, but I'm not one of those people. You probably aren't either. This shredder has an on-off-reverse switch that lets you turn it on, off, or reverse it if something gets jammed. It also has a lid that closes over the paper intake. The last feature of note on this shredder is the small transparent window on the front of the shredder that lets you see it's time to empty the shredder bin. Beyond that, there's not much to talk about. This shredder cuts stuff up. It doesn't make sandwiches. The cut up pieces of paper it spits out are about 1.75 inches long by 0.25 inches wide. For a standard 8.5" by 11" piece of paper, that results in about 213 pieces per page. I don't think anyone is going to want to put together 200 pieces of paper to steal my information. Add to that the fact that I occasionally shred some non-secret documents to increase the number of useless strips in my garbage, and I feel reasonably sure that no one is going to get anything useful out of my garbage. And I took a picture of that same loyalty card after I shredded it so you can see what happens to credit cards that you feed to this thing. I give this thing a rating of 1 out of 1. For me, it's just a tool. It does what I want it to do, and it's not too expensive. If you don't have crazy security requirements, this is the shredder for you. Pay any more for a shredder and you're wasting money. Pay any less, and, well, good job! 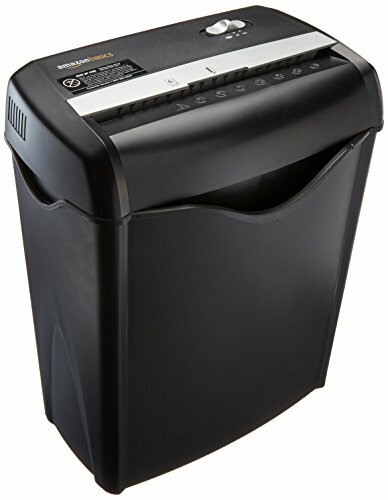 If you can find a similar shredder for less money, then I'd recommend you buy that one. The chances are pretty good that all shredders sold in America come from the same manufacturer and they're just rebranded a little bit for each American brand that wants to sell one.